Notes: Donnafugata Castle /'doʊn.nah fuː'gɑːtɑː/ is a fourteenth-century castle 15 kilometers (9.3 miles) from Ragusa in Sicily, Italy.There are many local stories that try to explain the origin of the name Donnafugata, which translates from Italian roughly as 'the fugitive woman' or 'the woman who fled'. Following what the name suggests, one legend claims that Queen Blanche of Navarre, widow of King Martin I of Aragon, was in hiding from Count Bernardo Cabrera who wanted to marry her and assume leadership over Sicily. 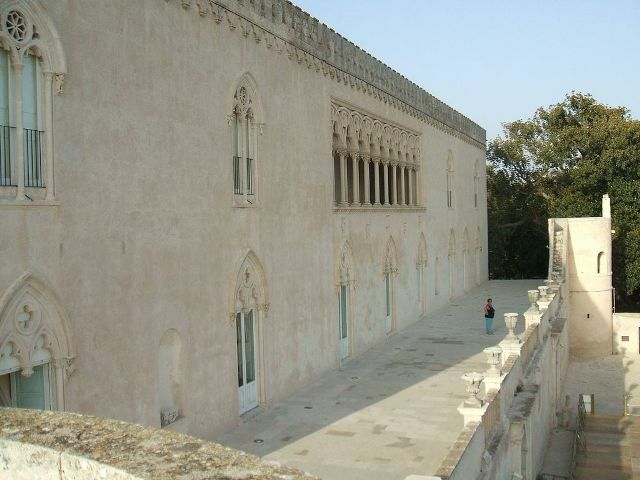 She hid in Donnafugata Castle until it was taken under siege by Cabrera, during which Giovanni Moncada helped her flee and hide again in the Steri Palace in Palermo. While this story may be true, it is not from whence the castle's name originates.